Here is a gift for the cat lover. 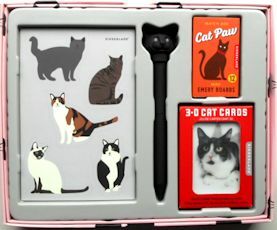 The gift box contains cat magnets, an LED meowing cat pen, mini emery boards with cat paw prints and 3D cat playing cards. The gift box is 9 1/2" wide x 7 1/2" high.